More than a year since his April 2017 arrest, Chris Soules has entered a new plea in his fatal car crash case. The former Bachelor, dubbed "Prince Farming" during his reality TV days, entered a written guilty plea to leaving the scene of a personal injury accident on Tuesday, Nov. 13, E! News has confirmed. He will be sentenced on Jan. 8, 2019 and faces up to two years in prison. The plea comes 19 months after he was arrested following a car crash in his native Iowa. At the time, the Iowa State Patrol confirmed to E! News that Soules was driving a pickup truck that rear-ended 66-year-old Kenneth Mosher's tractor trailer. According to authorities, the 37-year-old reality star left the scene prior to law enforcement's arrival and was later arrested 15 miles away at his Arlington home in the early morning. Mosher was taken to a nearby hospital, where he was pronounced dead. Soules' attorney, Gina Messamer, tells E! News in a statement, "The prosecutor has amended the charge down to a misdemeanor and Mr. Soules has entered a Conditional Guilty Plea to the misdemeanor charge. This misdemeanor charge carries a penalty ranging between a deferred judgment and no jail time up to two years' incarceration... The basis for Mr. Soules' guilty plea is that he failed to provide his registration information to law enforcement or 911 dispatch as required by Iowa law." Soules appeared in court the following morning, where he was charged with leaving the scene of a fatal car accident. He was released after his mother, Linda, posted $10,000 bail on his behalf. 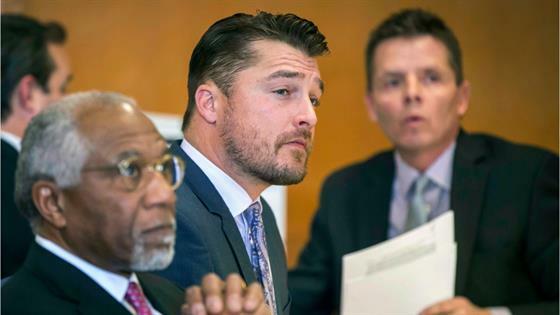 "Chris Soules was involved in an accident Monday evening (April 24) in a rural part of Iowa near his home," the reality star said in a statement issued by his attorney. "He was devastated to learn that Kenneth Mosher, the other person in the accident, passed away. His thoughts and prayers [are] with Mr. Mosher's family." "They both know each other," Mosher's neighbor Richard Roepke told E! News at the time. "[The Moshers'] know the Soules'...They are both long-term farmers with their roots here in Buchanan and Fayette County so that's what makes it even more difficult is that they are over the fence neighbors." Audio of a 911 call later revealed that Soules had called police before leaving the scene and checked Mosher's pulse and breathing during the call. Though Soules said he could feel a pulse, he confirmed there was blood coming out of Mosher's mouth and that he appeared to stop breathing. In May 2017, Soules pleaded not guilty to the charge of leaving the scene of a fatal accident. However, in January, Judge Andrea Dryer denied Soules' motion to dismiss the case. Soules rose to fame as a contestant on the 10th season of The Bachelorette before taking over as The Bachelor for season 19. He ultimately proposed to Whitney Bischoff, but the two called off their engagement just a few months later. He also competed on season 20 of Dancing With the Stars and ultimately reached fifth place.